And if you are flying overseas, God help you! Airlines are constantly changing their rules about how much luggage per passenger can carry. It is confusing and hectic as if traveling it self was not enough. The best idea to save yourself is by weighing your luggage before going to the airport that way you can avoid all the hassle and unforeseen inconveniences. Plus the extra amount you have to pay if your bags are overweight. I recently got chance to try this luggage scale ,which is very accurate and has lot of helpful features that are very appropriate while traveling. 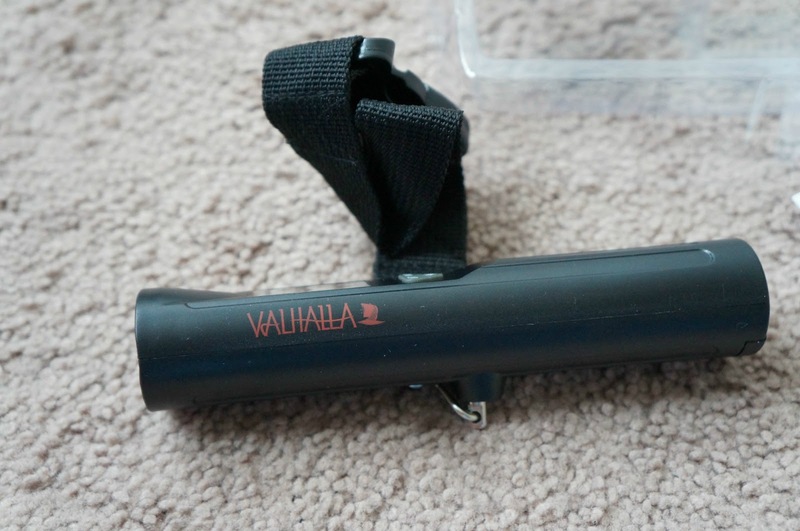 Valhalla Luggage Scale is small yet very durable. I love its sleek design that makes it easy to weigh and store. I had great experience with it. My suitcases weighed exactly the right lbs and there were no surprises. It has a tare feature and uses 2 Lithium Metal batteries that are included. This luggage scale can weigh up to 220.5 pounds. I love the LED flash light.I think it is a very smart idea,One less thing to carry when traveling. Now you can have your torch with your luggage scale. The backlit display feature is so helpful. You can weigh in dark and yet can see clearly. It automatically switches` off when not in use. I think this is a very handy gadget and should be in everybody's house. SAY GOODBYE TO OVERWEIGHT CHARGES - Two-handed grip allows for easily measuring bags up to 110 Lbs, with 0.01lbs. precision. WITH WEIGHT IQ TECHNOLOGY - The Backlit LCD screen with Data Lock, Tare Function and Overload Indication instantly measures in lbs./Oz./kg./gr. with unparallelled precision. BUILT TO LAST- Durable and lighter than your phone, the compact size conveniently fits in your luggage or car! PAYS FOR ITSELF WITHIN THE FIRST USE OR YOUR MONEY BACK - Overweight fees can cost more than your ticket, and we offer a 100% Satisfaction Guarantee. Travel can be stressful enough!